Fabric for my new project The Spider Wed Quilt. I have been playing with it for a week. I am using Batiks and some hand dyed fabric. 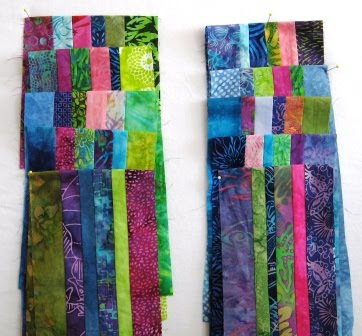 Batiks and hand dyed quilts are my favorite. I love to work with the tight weaved fabric. 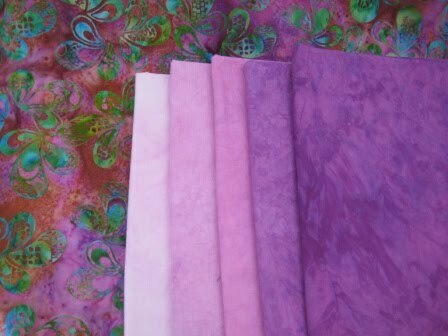 I think I may try the four pink hand dyed fabrics for my background colours. I drew out the block. 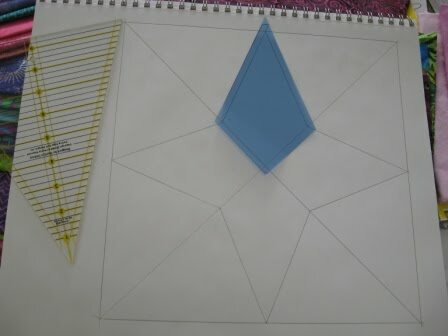 Now I have pattern pieces and can use my 30 degree ruler I bought so many years ago. I started cutting strips. I will confess, I started to do the cutting before the fish pond quilt was done. I did not sew, just cutting. I cut some more. 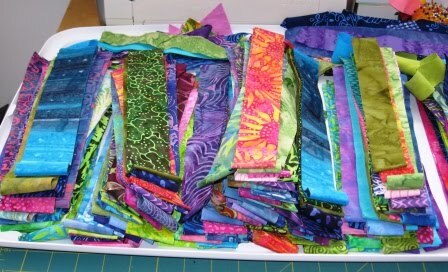 I am now sure I have to much fabric and my quilt is going to be bigger. 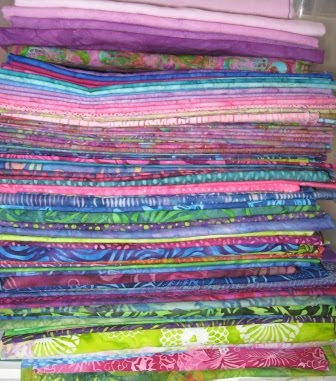 I was thinking of making a large lap quilt or twin but I think I could make a queen sized quilt. I just love all the fabric I picked out. 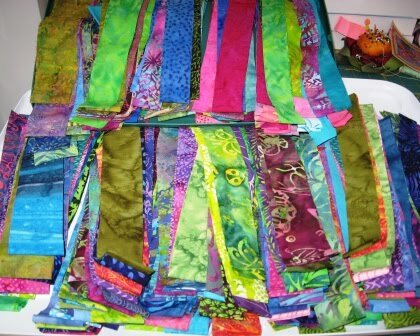 I lined up sets of six fabric in rows and piles. Then I sew sew. I started to get something done this weekend. Look at all these pretty strip sets. 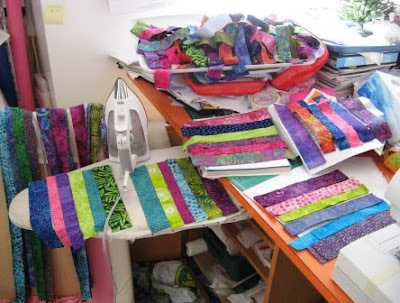 Love your strip sets, it is fun following a quilt from the start. Stay warm. These fabrics are absolutely stunning-( Did you feel my drool coming through the screen LOL) Batiks are among my favorite favorites because of their rich hues. I have admired your quilts at the Edmonton guild over the years - this one will be a real beauty. I like the block pattern you have created. Thanks for stopping by my blog during OWOH. I will look forward to seeing this quilt develop on your blog. I also enjoyed reading about your mother's African quilt. I like the way she joined up the blocks. I am still pondering how to use some animal nature panels for a quilt for my father who is turning 80 in April. 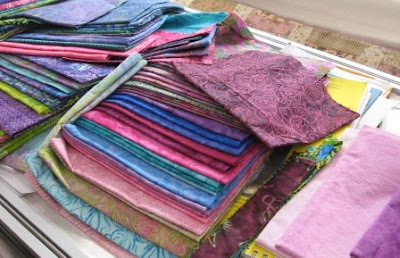 I have the fabrics its a matter of coming up with a design- I best get going on it don't you think? Do you still do your own hand dyed fabrics? 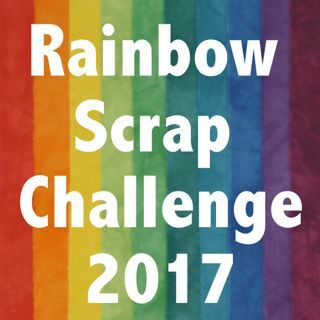 Thanks for the link to the Edmonton guild. I have not been in quite a long time and did not realize that they had moved to way south.